Pioneer British Columbia teacher Frances Fleming’s many achievements explain why she is known as “Superteacher”. Frances Fleming has many firsts to her name: she was the first woman administrator of a large B.C. 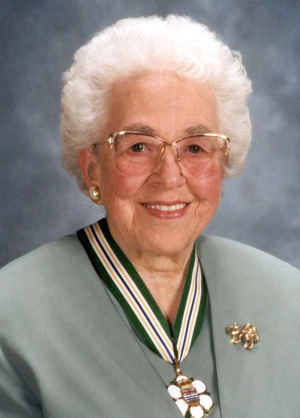 secondary school, B.C.’s first woman superintendent of schools, a member of the first official Board of Trustees of the Sechelt Public Library Association, and spearheaded a campaign which finally resulted in the opening of a modern new fully automated library. Mrs. Fleming was also a distinguished educator with the B.C. Ministry of Education. Under her leadership, Pender Harbour Secondary School became the smallest fully accredited B.C. school. In a survey that year, the Province newspaper rated that school the best in B.C., based on the Provincial Grade 12 results. At age 83, she continues to keep abreast of educational developments and writes numerous articles for publications.